DASAG Verfahrenstechnik und Anlagenbau, Nordhausen, Germany, has recently introduced an advanced bulk bag metering station which offers dustfree handling within a closed system. Special features include: adjustable flow volume and flow velocity; part emptying of bulk bags; the capability to return surplus material to the bulk bag; and a flexible design concept. The system includes a DASAG powder pump plus weighing compensator. The control system includes a SIWAREX module and an SPS S7-300 with OP3 panel to control all functions of the plant. 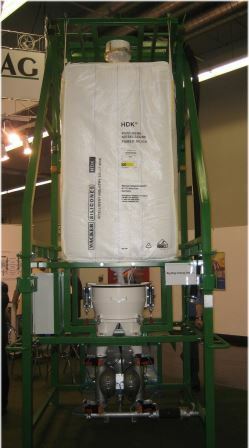 •	After docking of the bulk bag, the dosing parameters and conveying programme are preset. The contents of the bag can be fluidised by means of special mechanisms. •	Gravimetric metering is effected by the powder pump. •	Metering starts after all preparatory measures have been completed when the level control sensor in the docking system is covered. •	Monitoring of the product flow out of the bag results from the interpretation of the level sensor in the docking system. Discharge assistance is switched on if required. •	The bulk material is conveyed by an air-reduced pumping principle. •	Any remaining agglomerates will be destroyed by the movement of the membrane. •	After the set value has been attained, any excess material is fed back into the bulk bag.